Press Release - March 11, 2013 - The Second Joint Meeting of the CRFM/CLME Flyingfish (FF) and Large Pelagic Fisheries (LP) Case Studies Steering Committees will open at 9:00 a.m. on Monday, March 11, 2013, at the Garraway Hotel in Roseau, Dominica. The maximum total annual landings of flyingfish in the Eastern Caribbean is 4700 metric tonnes, according to information published by the Caribbean Large Marine Ecosystem (CLME) project, one of the organizers of the event. “The flyingfish fishery of the Eastern Caribbean is a shared resource which is exploited by seven countries including Trinidad and Tobago, Grenada, St. Vincent and the Grenadines, Barbados, St. Lucia, Dominica and France (Martinique). For these countries, there is a high social and economic dependence on the fishery,” the CLME added. Honourable Dr. Kenneth Darroux, Dominica’s Minister of the Environment, Natural Resources, Physical Planning and Fisheries, his Permanent Secretary – Samuel Carrette, and Milton Haughton, Executive Director of the CRFM Secretariat, will address the gathering during the opening ceremonies. At next week's meetings, the CRFM/CLME Steering Committees will review and endorse the outputs and recommendations of the two case studies, including the proposed Strategic Action Programme for each of the two Fisheries. 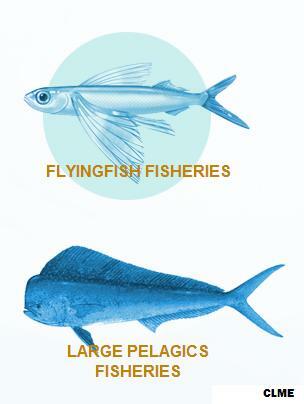 The flyingfish case study will be discussed on Monday, March 11, while the large pelagic fishery on Tuesday, March 12. Participants will include national and regional technical and scientific fishery experts who have responsibility for conducting fishery research and fishery assessment activities, and for formulating fisheries management advice. The CLME Case Study Steering Committees were established in 2011 to provide guidance to the CRFM and participating States on the implementation of the case studies in keeping with the approved research proposal and grant agreement between UNOPS and the CRFM Secretariat.